Wyatt Gallery, a person not a place, is an award-winning photographer who uses his photographs to raise awareness and support for communities damaged by natural disasters. 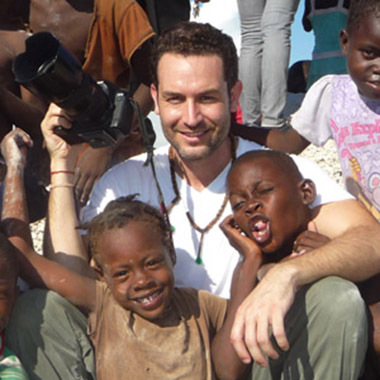 He published his first book Tent Life: Haiti in 2011 with Umbrage Editions and donated 100% of the royalties to relief efforts through J/P HRO, The Global Syndicate, and Healing Haiti. After Hurricane Sandy in 2012, Wyatt and the Foley Gallery organized #SANDY, an exhibition of iPhone photographs by professional photographers that raised $21,000 for rebuilding efforts in New York City. Wyatt edited and published a book of these photographs with Daylight Books that was then featured in the exhibition Rising Waters at the Museum of The City of New York in 2014. Wyatt’s work has been exhibited worldwide and is in major public, private, and corporate collections such as the Museum of Fine Arts Houston, The George Eastman House, the Museum of The City of New York, New Orleans Museum of Art, American Express, and Comcast, amongst others. His work has been featured in Esquire, the New York Times magazine, Departures, Condé Nast Traveler, Mother Jones, Oprah’s OWN TV, NBC, the LA Times, Fast Company, NY1 News, and more. Wyatt received his BFA from New York University’s Tisch School of The Arts in 1997 where he was awarded the Rosenberg Grant to travel the Caribbean. He’s a recipient of a Fulbright Fellowship to Trinidad, the PDN 30 and Rising Star, the Santa Fe Center Editor’s Choice Award, and was featured in 25 Under 25 Up-and-Coming American Photographers by Duke University Center for Documentary Studies published by PowerHouse. Wyatt was an adjunct professor at the University of Pennsylvania and continues to inspire students through frequent lectures at New York University, the School of Visual Arts, the New School, Wharton, Kutztown, the International Center for Photography, and numerous high schools. Wyatt is based in New York City but is more frequently found in the Caribbean. His forthcoming book will be Jewish Treasures of The Caribbean, once he raises the funding.